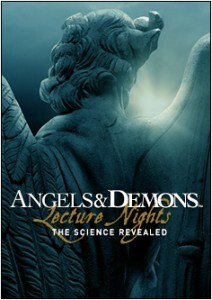 Institutions around the world will be hosting public lectures about the science behind Angels & Demons. Both Fermilab (on May 21) and SLAC (on May 12), along with many other institutions worldwide will be presenting public lectures on the science behind Angels and Demons. On Tuesday, May 19, 2009, 1 p.m. US EDT, the National Science Foundation will Web cast live a discussion by CERN Director-General Rolf-Dieter Heuer, Nobel Laureate Leon Lederman, and Fermilab Distinguished Scientist Boris Kayser on the topic. Journalists wishing to ask questions should contact NSF's Lisa-Joy Zgorski ahead of time. In Angels and Demons, the new Tom Hanks movie based on the novel by Dan Brown, the race is on to discover a time bomb made of antimatter--what Brown describes as "the ultimate energy source"--before it blows up the Vatican. There's nothing fictional about antimatter. It's all around us, all the time, raining down in debris when cosmic rays hit the atmosphere, or used in medical procedures like PET scans, which make images when positrons (anti-electrons) from a radioactive tracer annihilate with ordinary electrons. In fact all antiparticles quickly annihilate upon encountering their ordinary-matter counterparts. But these events rarely release enough energy to be noticed unless, like a PET scan operator, you're looking for it. And while it can be collected in the storage rings of accelerators and light sources or confined by other kinds of electromagnetic traps, most antimatter is transient, gone in the wink of an eye. It takes a lot of care and attention, plus a significant investment of energy, to create even the simplest anti-atom, antihydrogen--which consists of one antiproton orbited by one positron. Granted, antimatter may be the ultimate energy source--the energy released by annihilating a mere milligram of antimatter would be equal to 43 metric tons of TNT--but manufacturing antimatter is a voracious energy sink. So much energy would be needed to gather enough antihydrogen to fuel a rocket or make a bomb that, with current or even foreseeable technology, the undertaking is utterly implausible. As Joel Fajans of Lawrence Berkeley National Laboratory puts it, "The Vatican need not fear." If it's not an energy source, why bother with antimatter? Fajans, who is also a professor of physics at the University of Californica, Berkeley, has been making antihydrogen for several years as part of the international ALPHA collaboration at CERN, the European laboratory for particle physics headquartered in Geneva, Switzerland. He explains that one of the most challenging puzzles in physics is why the universe is made almost entirely of ordinary matter. "Up until the 1960s it was thought that if the sign of a particle was changed"--from the negative charge of an electron, for example, to the positive charge of a positron--"and if the particle was changed into its mirror image, the new antimatter particle would behave identically to the old ordinary particle. This principle was called CP invariance, where C stands for the change in sign and P for the mirror reflection, known in physics jargon as parity inversion." Fajans says, "Physicists were quite surprised to discover in the 1960s that CP invariance was not, in fact, correct." CP invariance suggests that equal amounts of matter and antimatter were made in the big bang, and equal amounts should still remain today. Clearly this isn't so, and physicists don't completely understand why. In a simple hydrogen atom a single electron orbits a single proton. In an antihydrogen atom a single positron (anti-electron) orbits a single antiproton. But, says Fajans, "There is a combined conservation law: charge, parity, and time reversal invariance, which says physics laws for antiparticles moving backward in time ought to be identical--or CPT invariant--to those for ordinary particles moving forward. No one has ever observed a violation of CPT invariance, but are there exceptions?" One place to look for CPT violations is to compare transitions in the energy states of ordinary hydrogen and antihydrogen. Are the transitions between the energy levels of an electron orbiting a proton, the nucleus of an ordinary hydrogen atom, precisely identical to the same transitions of a positron orbiting an antiproton? "If not, it could ultimately tell us a lot about why there is more matter than antimatter," Fajans says. And there are farther-out considerations. Do ordinary hydrogen atoms and antihydrogen atoms respond to gravity in the same way? If an ordinary apple falls toward Earth and an anti-apple falls toward an anti-Earth, would an anti-apple "fall" upwards on an ordinary Earth? Can anti-atoms defy gravity? Before 2002 only a hundred or so antihydrogen atoms had ever been made, in experiments at CERN and at Fermi National Accelerator Laboratory. Through continual refinements, however, devices like CERN's ALPHA and a neighboring experiment, ATRAP, have made hundreds of millions of antihydrogen atoms. Says Fajans, "The recipe for antihydrogen is to take about 10 thousand antiprotons and cool them to several kelvin"--a few degrees above absolute zero--"and then take about 10 million positrons and cool them to several kelvin, and then mix them together while keeping them cold and confined." Sounds easy, once you've got the antiprotons and positrons. Making positrons isn't all that difficult. After P. M. Dirac predicted their existence in 1928, Carl Anderson found the first ones in cosmic radiation in 1931; positrons are now routinely collected from the decay of certain radioactive isotopes like sodium-22 (22Na). Physicists make antiprotons by slamming energetic protons into a target. The first antiprotons weren't made until 1955, and the discovery required a machine tailor-made for the purpose, Berkeley Lab's Bevatron, which at the time was the world's most powerful accelerator. Today CERN makes antiprotons in much the same way, then cools them to lower energy within a machine called the Antiproton Decelerator (AD), which is essentially an accelerator running backwards. The AD is separate from CERN's vastly more powerful Large Hadron Collider, and the ALPHA experiment doesn't involve the giant ATLAS experiment pictured in the Angels and Demons movie, which is intended for quite different purposes. Small as it is, however, ALPHA (which stands for Antihydrogen Laser Physics Apparatus) does what the LHC and ATLAS can't, which is to make and attempt to snare anti-atoms. Because antiprotons and positrons have electric charge, they can be controlled with electric and magnetic fields. At ALPHA's heart is an electromagnetic bottle called a Penning-Malmberg Trap. An antihydrogen production cycle begins by filling the trap from ALPHA's Positron Accumulator, in which positrons emitted by a source of 22Na coated in frozen neon have been collecting at the rate of about a million per second. About half of these survive the trip from the accumulator to the trap, where they are held by strong electric and magnetic fields that prevent them from hitting the trap's walls and annihilating. Inside the trap they are cooled by cyclotron radiation; spiraling tightly, they act like little radio stations which radiate their energy away. Meanwhile, bunches of some millions of antiprotons from the AD are entering ALPHA's trap at 100-second intervals. Most fly straight through, but about 40,000 are caught and bounce back and forth in the strong electric and magnetic fields, where they are cooled by collisions with previously trapped electrons. The ALPHA experiment at CERN seeks to trap antihydrogen atoms inside a magnetic “bottle” consisting of a superconducting octupole magnet and two mirror coils. As both kinds of antiparticles cool down, they approach comparable energies. Finally, they mix and combine into atoms that are decidedly unusual--not just because they are made of antimatter, but also because they have so much extra energy that the positrons are bouncing around the antiprotons in very complicated, high-amplitude orbits. Unfortunately, just at the moment of combining into anti-atoms, the joined positively and negatively charged antiparticles are rendered electrically neutral, and the anti-atoms quickly escape the electromagnetic trap. Until recently, the only way to be sure antihydrogen atoms had been created in ALPHA was by detecting their annihilations against the trap's walls. To study the energy spectra of antihydrogen atoms it will be necessary to keep them from blowing themselves up for a lot longer than the few thousandths of a second currently possible--they will have to be detained for at least a few seconds. Luckily even neutral atoms have a small magnetic moment; they can be confined by a magnetic field of the right shape and strength. (Any spinning neutral particle--a single neutron, for example--has a small magnetic moment, because it is made up of charged particles, like quarks, in motion.) The current ALPHA plan uses magnetic fields specially shaped by an octupole (eight-pole) magnet as part of the trap. "The basic idea is that, if an atom isn't too energetic, it can be held in a magnetic minimum--a region from which the strength of the magnetic field grows stronger in every direction," Fajans says. "The challenge is how best to create such a field. We do it with superconducting magnets--mirror coils to create a minimum in the middle of the trap's axis, plus an octupole magnet to create a minimum in the center of the trap's radius." The design of ALPHA's magnetic trap was developed and refined at Berkeley Lab by a large team of Berkeley Lab and UC Berkeley scientists, visitors, and students, including Jonathan Wurtele, who is also a professor of physics at UC Berkeley, Alex Friedman, David Grote, Ron Cohen, and Jean-Luc Vay; visitors Dirk van der Werf, Alon Deutsch, and Katia Gomberoff; UC Berkeley graduate students Will Bertsche, Steve Chapman, and Alex Povilus; and undergraduates Korana Burke, Crystal Bray, and Andrea Schmidt. In 2008 ALPHA experiments using the magnetic trap, almost 400 mixing cycles produced copious quantities of antihydrogen, pairing up to 50 percent of the antiprotons in the trap with positrons, for a yield of some 20 million anti-atoms. "The way we search for antihydrogen is by destroying the electrostatic wells to sweep out any antiprotons still in the trap," says Fajans. "Next we turn off the magnetic fields, within milliseconds. Any antihydrogen we've trapped hits the walls and annihilates, and we can detect the annihilations." The ALPHA experiment has created hundreds of million of antihydrogen atoms. The challenge is to hold onto them for at least a few seconds before they escape the trap and annihilate with ordinary atoms in the apparatus walls. "It's a severe event, but it dumps the magnetic field really quickly," says Fajans. "We did tests at Berkeley Lab to make sure the ALPHA magnets could survive." Survive they did. Yet despite the number of antihydrogen atoms created in the trap and the quickness of the researchers' attempts to catch them, the 2008 ALPHA experiments discovered no trapped anti-atoms. "Why haven't we trapped any antihydrogen?" Fajans asks. "Unfortunately, with current magnet technology, we can only build a very shallow trap. The root problem then is that our antiprotons are still too energetic." "We hope that with a variety of technical refinements--such as slowing down the antiprotons as they enter the trap, cooling the positrons more before they interact with the antiprotons, and revising the mixing technique--we can make antihydrogen which is cold enough stay in our shallow trap." The day when antihydrogen atoms by the hundreds or thousands are not only created but kept around long enough to study is growing closer. But neither the Vatican nor anyone else needs to worry; the noisiest, most energetic explosions accompanying that event are likely be popping champagne corks. This article first appeared at Berkeley Lab's News Center on May 5, 2009.